Late on the scene, the first vines were planted in the mid-late 60’s, thanks to the assessment of its viticultural potential by Dr. John Gladstone. With the first harvest occurring in the early 70’s, it didn’t take long for the wines of the region to sky rocket to international acclaim. The Southern and Indian Oceans meet at the southern most tip of this region, creating a classic maritime influence. This means the region has long summers with generally cooler temperatures, with cool but not cold winters and precipitation that is dispersed throughout the year. Add to that the gravelly soils, and you have a perfect combination for high quality Cabernet Sauvignon, awarding it the ‘ Mouton Rothschild of Australia’. However, Margaret River is capable of producing all of the classic varietal wines and has gained a reputation for clean and classic Chardonnay and is a leader in production of the Australian blend Semillon Sauvignon Blanc (SSB) a deliciously, bright, refreshing wine. 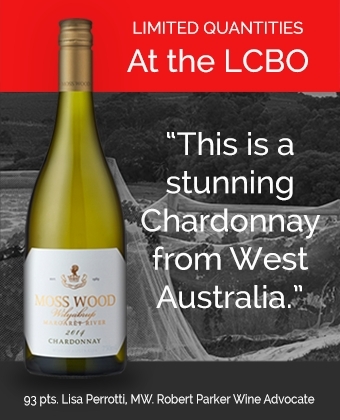 To try some of Margaret River’s icons, get yourself to the LCBO and pick up the Cabernet or Chardonnays from both Leeuwin Estate and Moss Wood. Both leading founders of the region now producing wines with international acclaim. A magnificent opportunity not to be missed!